I have mentioned, before, that I am not the world's greatest chef/baker, but from time to time, I have some successes. So many times, I have had biscuits and baked goods come out too thick or hard as a rock. Today, I want to share a successful recipe with you! "We have verified that the Bisquick Gluten Free product does not contain flax seed and is not manufactured on the production line with products that contain flax seed. Our products are labeled for the top 8 allergens (peanuts, tree nuts, dairy products, eggs, soy, wheat, crustaceans, and fish) plus sesame, sunflower and mollusks. We label for these allergens using CONTAINS and/or MAY CONTAIN lists located directly below the product’s ingredient list. 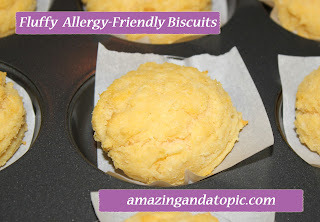 CONTAINS means that the allergen(s) is included in the product’s recipe. The allergen(s) will be listed in the ingredient list, and also in the CONTAINS statement just below the ingredient list. MAY CONTAIN means that the allergen(s) is not in the product’s recipe but could be present as result of the manufacturing process regardless of our best efforts to exclude it. These allergens will not be included in the ingredient list. Both CONTAINS and MAY CONTAIN mean that if you are sensitive to the specific allergen(s) in the list, no matter which way it is listed, you should avoid this product. This ingredient and allergen information is for the package in hand. It is not intended for other packages of the same product. Ingredients may vary from one package to another due to product reformulation. If you have allergy concerns, please carefully read the ingredient information on each package." Given the above information, please note that the Bisquick Gluten-Free Baking Mix has a "MAY CONTAIN SOY INGREDIENTS" warning. Read the label EVERY TIME! I made substitutions to the recipe for biscuits, on the back of the Bisquick GF box. Instead of milk, I used original rice milk. I used Spectrum for the shortening. To substitute 3 eggs, I made 2 "eggs" using Ener-G egg replacer and for the 3rd "egg", I used 1/4 cup of sweet potato baby food. Place baking mix in a large bowl and cut in shortening with a pastry blender, or fork/knife. along with sweet potato puree and rice milk. Blend until a soft dough forms. Using a large cookie scoop, place dough on a prepared baking pan, lined with parchment paper. Bake at 400ºF for 13-17 minutes. Food Allergy Bloggers Conference Ticket Winner! Auvi-Q 0-Dollar Out-of-Pocket Savings Card!